that this small souvenir is prepared and given to you. this book is affectionately dedicated. Git it name en got er right. "Hoo's a Hoo-chee! Hoo-chee! Hoo?" Hit say, "Hoo's a Hoo-chee! Hoo!" Leaves no fedders, fur ner track. Ghos' sez, "Hoo's a Hoo-chee!-Hoo?" a ; ::: ;: :! :ii . : -l- *: i "" '. .
ory of our college years. a few years, there was talk, but merely talk, of the foundation of a University. to the establishment of two seminaries, one east and one west of the Suwannee river. Seminary was moved to Gainesville. College". This act, however, did not exactly comply with the "Land Grant College"
and the State received ninety thousand acres of land from the Government. finally Lake City was chosen in 1883, just eleven years after the land was granted. school was changed to "University of Florida". these six institutions into two, under the unlovely names of "Florida Female College"
and given the best years of their lives for its sake. To them the highest honor is due. widely believed she will have no equals. Even as they, the paths that lead afield. Of Earth's fierce battles, soon to be your own. Club, Stock Judging Team (2). Friday, with apologies to DeFoe. (4), University Orchestra (1, 2, 4). College Baseball (2), Representative Law College at Florida State Fair (3). She's a bootlegger's daughter, and I love her still. JULIAN ALFRED BLAKE, "Julian", Jacksonville. Law LL.B. Phi Delta Phi, Newman Club. Serpent Ribbon Society, Benton Engineering Society. Serpent Ribbon Society, Polk County Club, John Marshall Debating Society. Sigma, F. V: C., Putnam Club, Ag Club. A good, angelic boy-nothing like Heyward. Pistol Team (4), Student Assistant in Biology (4). Lived in F Section three years and never got over it. A. E. F. 18 months. cil (4), Cadet Captain R.O.T.C. (4), Blue Ridge Conference, 1922. W. J. B., the silvery tongued son of the South. (3), Pan-Hellenic Council (4), "43" Club. Epsilon, Theta Ribbon Society, Miami Club, Ag Club, Mispah Club. Waiter Boy (1, 2, 3, 4), A. E. F. (1918-19). Really should have gone out for track. (4), Benton Engineering Society, Seminole Staff, Captain R. O. T. C. (4). ROBERT ARTHUR CARLTON, "Buck", Knights. Agriculture B.S.A. He's not bashful, so he must have been too busy to fill out a questionnaire. John Marshall Debating Society, Mizpah Club, St. Augustine Club, Brotherhood Club. Large and roomy; built for comfort, not for speed. The wild, wooly, witty, Peruvian. Lieutenant R. O. T. C. (4). The one that owns the skeeter. R. O. T. C. (4). "I'll match you to see who pays for it." Club, Cadet Captain R. O. T. C. (4). Yeh, he's still around here; majoring in Red Book. President (4), Teacher's Senior Club, College Basketball (3), Cadet First Lieutenant R. O.
T. C. (4), Pistol Team (4), Student Assistant in Horticulture (3, 4). She's a Philathea, but he calls her Minnehaha. Another old-timer;. he was treasurer of the Tennis Club in '16. Come on, no one will ever know the difference. Heart whole and fancy free-even after a couple of Summer Schools. Staff (3), University Band (12, 3, 4), Librarian (3), University Orchestra (1, 2). Spends his week-ends in Jax. First Lieutenant R. O. T. C. (3). Gives all the girls a treat. legians", A. E. F. 2 years. Still goofy; he thinks his nickname is Jack. GEORGE RANSOM GRAHAM, "George", Fort White. Teachers B.S.A.E. Son of Mr. and Mrs. Graham. Gamma Sigma Epsilon, Serpents, Alligator Staff (3), Seminole Staff (3). Scabbard and Blade, Serpents, Secretary-Treasurer Student Body (4), First Lieutenant Co.
Student Assistant Animal Husbandry (4). You're darn right, he's a busy man. ALEXANDER ANGUS GILLIS, "Alec", Ponce de Leon. Engineering B.S.C.E. Phi Kappa Phi. A. A. E., Treasurer (4), Budget Committee (4). He's from West Florida; nuff sed. Baseball (4), Class Track, Basketball and Baseball. Business Manager Alligator (2), Track (1), Football (3), University Minstrels (1). One vote, one ice cream cone. Society, Class Football (1, 2), Class Baseball (2). An m. d. to b. Football (1, 2, 3), Captain (2, 3), Volley Ball Team (1, 2), Second Lieutenant R. O.
Marshall Debating Society, Secretary-Treasurer (2), Vice President (3), A. E. F.
HENRY GLENN HAMILTON, "Hillbilly", Humboldt, Tenn. Agriculture B.S.A.E. 1921, M. S.
(2), Ag Football (3), A. E. F. 1918-19. Only a few of them left. (4), Pan-Hellenic Council (3, 4). His record-eight in one week. He knows 'em all by their first names. Phi. First Lieutenant Company "B" (4). "Not too boisterous; just loud enough to be heard." Arts and Sciences Debating Team (4), Battalion Adjutant (4), A. E. F. 9 months. The answer to a maiden's prayer. County Club, First Lieutenant R. O. T. C. (4). You'd never think it, to look at him, would you? Ribbon Society, Farr Literary Society. American Law Book Co. Prize (2), Representative Law College at Florida State Fair (3). The married man with the mason-dixon line. CHARLES WARD JOHNSON, "Ward", Largo. Law LL.B. Chi Delta, Pinellas County Club. You know him; Mr. Johnson's son. President (3, 4), Law College Football (2), Law College Representative State Fair (4). First Lieutenant R. O. T. C. (4). Stand back and let a good man pass. Society, Pinell.s County Club, Franklin Club. Society, Bookkeeper and Cashier U. of F. (1, 3). "How can the University get along without me?" Volusia County Club, First Lieutenant R. O. T. C. (4). Yeh, he went to Stetson a whole year. Sigma, Benton Engineering Society, A. A. E., Pinellas County Club. She really likes him; do you blame her? Class Basketball (2), Ramsey Waiter Boy (2, 3). Debating Society, Law College Football (1, 2, 3), Assistant Business Manager 1922 Seminole. "You go thru to Tallahassee, I'll get off at Madison." Club, President (4), Baptist Club, Varsity Debating Team (4), U. S. Army 1918-19. My goodness, that's not nice. F. Band (1, 2, 3). (2, 3), U. of F. Orchestra (1, 2, 3, 4). Now, girls, don't hurt me. Student Directory (4), Rifle Team (1). Beyond the Alps Lies Rome. Lieutenant R. O. T. C. (4), Blue Ridge Conference 1922. Bashful, but give him time. "48" Club, Honor Committee (3), Class Baseball (3), Pan-Hellenic Council (3, 4). He used to look like a billiard ball. Astronomical Society, Vice President (3), "48" Club, Seminole Staff (3). "You may not believe it, but I'm the only one in my family who doesn't *"
Epsilon, Franklin Club, Society of Automotive Engineers, Buckman Med l, June 1913. Farr Literary Society, Flint Chemical Society. "Sho Ishubella Shez to Columbush *"
Sigma, Ag Club, Flint Chemical Society, Second Lieutenant Inf. 29th Div. A. E. F.
"When I played against Jim Thorpe *"
Another three-year wonder; he may be bright but he don't crow. Epsilon, Flint Chemical Society, Benton Engineering Society, Alachua County Club. Lineal descendant of both Antonius and Aurelius. Too big for a man and too small for a horse. College Football, College Basketball, Class Basketball, Swimming Team, Volley Ball, Capt. 'S funny; he's never gone out for baseball. JOSEPH G. SMITH, "J. G.", Tignall, Ga. Agriculture B.S.A. Ag. Club. No, Pocahontas; his first name is Joseph. Ribbon Society, Pirates, Baseball (4). mittee (4), Pan-Hellenic Council (4). "All right gang, let's get together on this *"
"I'd a turned it in a month ago, but I didn't know who to give it to." Blade, F Club, Football (3), Track (3), Captain Track Team (4), Captain R. O. T. C. (4). LLOYD DENISON STEWART, "L. D.", Bradentown. Agriculture B.S.A., Teachers B.S.A.E. Class Baseball (3), College Football (3), Scrub Football (4), First Lieutenant R. O. From the Greek "icthus" meaning "fish". Club, Serpent Ribbon Society, John Marshall Debating Society. If the folks could see him now. 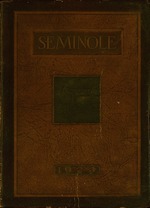 President (2), Seminole Staff (4). Gamma Lambda, Inverness Club, Cosmopolitan Club, Theta Ribbon Society, University Band. "Gangway, girls. This is the night I study." So strong, but oh, so gentle. "We've been around, ain't we Bullock?" F Club, John Marshall Debating Society, President'(4), Varsity Baseball (1, 2, 4). Made the varsity b- team. Major R. O. T. C. (4). Made 'em all, didn't he?" (1, 2, 3), Delegate to Southern Federation of'College Students (4), A. E. F. 21 months. Orange County Club, Ag Club. Sophomore years, Honor Man Scholastically (1, 2). we fitted in withthe college regime andhelped to make the traditions of Florida. a spifit that hos followel us to the end. vear showed their love for Florida and took their part in all activities. nosed out by the Sophomores in basketball. gratitude for tlfeir unselfish devotion. .............. i ; !** . For the Gentleman in Question is a simple Sophomore. As if he'd like to operate upon your lower slats. He'll tell you, "Yes, he's one of those confounded last-year's rats!" "That fellow? Oh, he's nothing but a good-for-nothing Soph. He'll be proud to say he's been a Sophomore. thru many years of after life. usually done with the aid of superior weight and numbers. Junior Class the honor and hard work of issuing the Seminole. l .. iJ < Oy-j^' . ;*' *' -.^ ',;:. '*, '* . ii~n ** '*n ~f a~s ..'. '^ ^ ^ l ^. *. ling the finances, and the like. four years on the team and winning undeniable recognition in all the games he played. His position was in the backfield. was seen in action for three years in this sport, being captain of the team in 1916.
tution, defeating Yale in a game with them. 5. Authorize the number of players to be taken on trips. 6. Arrange all schedules after consulting with coaches. 7. Enforce all rules of eligibility. students' class and laboratory hours. seasons assistant coach in football at:. years. During this time he had com- cessful season next fall. University this year to enter the busi- lated his plans for a successful season. genial smile and friendly affection. supporters who maintained such a loyal faith in the activities of the team. well saw them in action when they journeyed up to tackle Harvard at Cambridge. len in the Dixie circle. kicking game with a well diversified offense to a good advantage. slipped down twenty yards from a touchdown. nineteen points to Rollins none. Legion team composed of some of the best ex-college stars produced in football. placed them on the large end of a 14 to 0 score. Gainesville and were snowed under with a score of 57 to 0. Mississippi College 58 to 0. Beautiful forward passing, broken field running, and. greatest defeat of the season. Orleans when the Gators trounced the much-touted Tulane team 27 to 6. "Ark"
the machine that hurled the "Green Wave" against the rocks. very one-sided and culminated with a 47 to 14 victory for Florida.